It is definitely a very proud RHU! RHU computer science graduate Ms. Sawsan Al-Jamal received the Netherlands Young Innovation Award from the Embassy of the Netherlands in Lebanon January 8, 2019. She was one of the five finalists out of the 33 applicants who presented their innovative ideas that contribute to the welfare and prosperity of Lebanon. 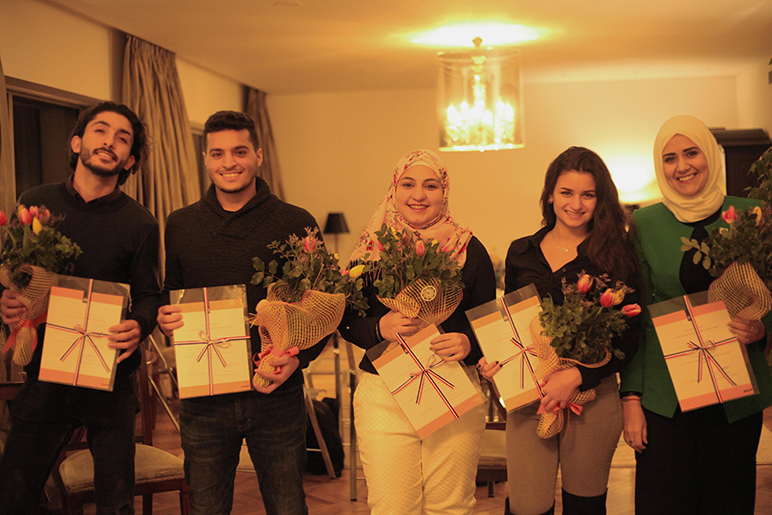 Esteemed Ambassador of the Netherlands in Lebanon, Mr. Jan Waltmans, greeted all five finalists at his residence. Ms. Al Jamal’s idea for the competition was based on her RHU graduation project which she further developed after graduating. “Her aims was to set up a platform that connects senior university students with companies to do complete their graduation projects. This way students are able to gain work experience and companies are able to outsource work to excellent students and create prospects for future employment. The platform is designed in a smart way that connects the demands of the private sector to students according to their personal skills,” stated the Embassy. RHU would like to thank the Embassy of the Netherlands in Lebanon for their initiative and express its full support and admiration to RHU alumni who never failed to make us proud. Sawsan Al Jamal is class 2018 computer science graduate. Writing to us she said, "No doubt that RHU and the CSIS faculty deserve a lot of credit and recognition." Sawsan, thank you for making us proud! Congratulations!